Illegal wildlife trade is a growing concern for leaderships and wildlife organizations around the world as it is driving several species to the brink of extinction. Since the turn of the century there has been an unprecedented expansion of global trade in animal parts driven by rising demand in specific parts of the world, particularly Asia. Emerging economies, especially China, have seen a rise in purchasing power in particular sections of the society in recent years which has led to the creation of the noveau riche class. This class comprises of the principle consumers driving demand and aiding the expansion of this trade. A study by Ivory market researchers Lucy Vigne and Esmond Martin has found a steep rise in demand for ivory in China reflected by ever greater items on sale, growing number of carving factories, legal and illegal retail outlets. 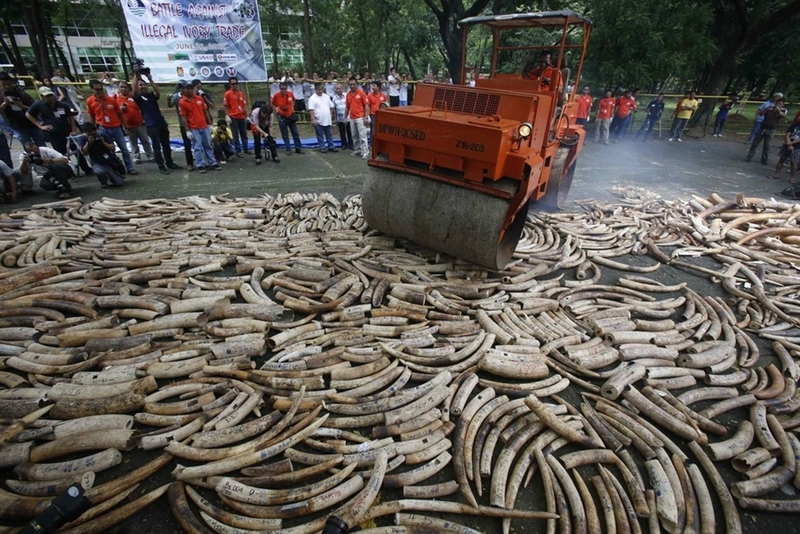 The study analyzes the dynamics of ivory in the highly complex society of China where trade is driven by a range of actors starting from political leaders , organized criminals to consumers and civil society organizations. Each of these has a special role to play in this nexus and an indepth analysis is required to ensure that campaigns target each effectively. For example, consumers who purchase ivory can be driven by special motives. Investors banking on the continued rise of ivory prices appear to be significant contributors to the recent boom instead of the traditional buyers and carvers. This would imply that an awareness campaign would be more effective in swaying traditional consumers rather than the class unscrupulous investors. Moving away from the consumption of animal parts, we now analyze production side issues which multiply the problem of illegal trading. Due to the very nature of the problem, it is impossible to obtain reliable data but its obvious presence does allow one to make measured comments about the trade. The business is run by dangerous international networks, which have interlinkages with other illegal trades of drugs and arms as well as terrorist groups. It is worrying that terrorist groups raise funds by smuggling ivory and Rhino horns.The armed militia , carrying out mass poaching, is equipped with sophisticated military equipment. In 2013, in Congo’s Garamba national park, a herd of 22 elephants was gunned down from an army helicopter using AK-47 assualt rifles with a single fatal shot to the top of the head hinting at use of professional marksmen. This problem is further exacerbated when we consider the lack of training and equipment provided to forest rangers. Most are armed with only a sharp stick or machete.According to reports, around a thousand rangers have been killed on 35 different countries over the last decade. Moreover the job of a ranger entails extreme isolation and familial sacrifices and the compensatory nature of the profession creates the fundamental need of finding employees who are passionate. Otherwise they will be susceptible to bribes from the militia. Black-market ivory is priced at a value which rivals that of gold. The value of a pair of Bull Elephant ivory tusks is 15 times the average salary of a forest ranger. Given this margin , the militia is able to provide attractive financial rewards to them in return for a helping hand. In Mozambique, 30 rangers were arrested for their alleged role in helping poachers butcher the nation’s remaining 15 rhinos. The laidback attitude of law enforcement bodies and accompanying dichotomous laws only serves the cause. In many countries, the sale of ivory is illegal but the collection of tusks as hunting trophies is not. Many African countries claim that trophy hunting and tourism bring in money into the economy. One final concern is that civil wars in Africa have become the perfect front for poaching. The Congolese army, Rwanda Democratic Liberation Forces and the national congress for the defense of the people have all been reported to take part in the widespread massacre of animals in the continent. Many areas become perfect grounds for killing due to the lack of governance and presence of any other law enforcement body. A summation reveals that illegal wildlife trade is driven by high profit margins constructed by weak judicial systems and toothless laws which make it a high return and low risk business.